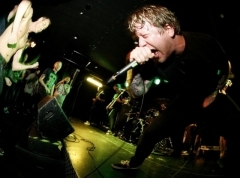 Having heard about AP's struggle to get in early enough to see August Burns Red on this anachronism filled tour I arrived at the Pyramid Centre 20 minutes before doors knowing that I can't, as with numerous other large venues, skip the queues to collect a photo pass and leisurely stroll to the front. Instead I'm left stood out on the road, some distance back from where the three tiered ramp that takes you up to the doors begins. To add to the drama I get to the box office to find I'm on the list but without a photo pass. Luckily a quick phone call to the tour manager and I’m sorted, with at least 5 minutes to spare in which to set up my camera (twice after learning we’re allowed to use flash) before August Burns Red take to the stage. It isn't hard to figure out why there was such a queue and various rumbles from people eager to see ABR, so much so that the circle pits begin before they even make it onto the stage. 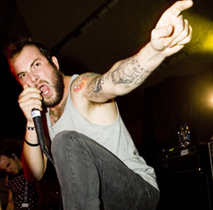 The Pennsylvanian based Christian Metallers are sent out to set the tone for the evening and they raise the bar pretty high for their tour mates to follow with a raucous set dominated by the ability of front man Jake Luhrs to command the stage. It's easy to see why a large portion of the crowd arrived so early and will have left many revellers with a new favourite band. If ever the cliché "start as you mean to go on" was created for a metalcore show, this was the one. A lot had been said from various people about A Day To Remember's somewhat disappointing displays earlier on this two part tour, but nothing was further from the truth with "The Downfall of Us All" picking up brilliantly from where August Burns Red had left off. Jeremy McKinnon's voice was one of the main complaints but tonight he managed to pull off the changes between singing and screaming seamlessly. A rather lighter mix of pop rock infused with chugging metal riffs are the order of the set and where in usual surroundings its rare to see support bands properly warm a crowd up, both August Burns Red and a A Day To Remember pull it off with aplomb. You could easily have put either band up to headline and they wouldn’t look out of place. 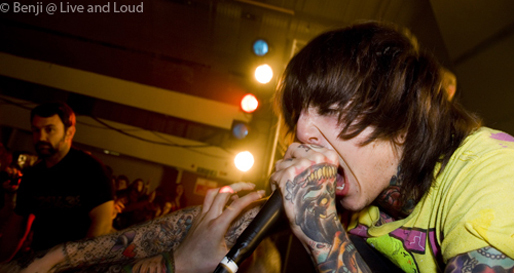 While I'll be the first to admit that I'm not the biggest fan of Bring Me The Horizon (I tried to listen to their first album before the show and came to the conclusion that Oli Sykes was replaced by an angry puppy for recording) I will admit they have the ability to put on a fantastic show. Again, I'd been told that they hadn't lived up to expectation and were unable to keep in sync possibly due to the recent hiring of former I Killed the Prom Queen guitarist Jona Weinhofen, but once again BMTH proved the skeptics wrong with a blistering set. 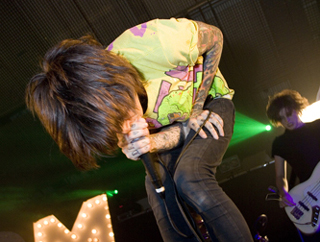 Sykes spends his time bounding between the numerous plinths on stage and the front row of the crowd, whilst the entire band climb up the illuminated BMTH backdrop for a synchronised leap more akin to Busted. Samples of their recently released remixed version of Suicide Season can be heard in the background between songs, but what is missing from tonight's show is the inclusion of a stage invasion which has occurred throughout the tour. Whatever happened at previous shows on the tour, all could be forgotten tonight. The hordes of fans emptying the pit poured with sweat and grins wider than a Cheshire cat. Whatever grasp Sykes has over his crowd looks to be growing stronger by the show. See more photos from this gig here.